The 96-well Microtiter Plate Magnetic Separation Rack is designed to be used with commercially available high-flanged 100 µl to 300 µl flat-bottom 96-well microplates. The 96-well plate magnetic rack is designed to be used with commercially available high flanged 100 µl to 300 µl flat-bottom 96-well microplates. 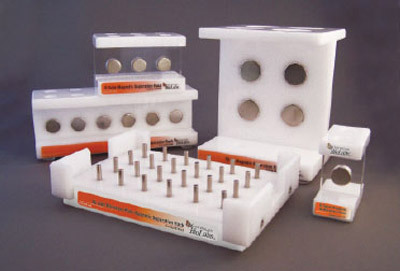 24 side-pull magnetic pins attract magnetic beads from solution to the side walls of four adjacent wells. The orientation of the magnetic field ensures complete removal of the magnetic beads from solution during pipetting steps, minimizing sample loss. NEB's Magnetic Separation Racks are now available in five sizes: 2, 6 or 12 (1.5 ml) tubes, 4 (50 ml) tubes and a 96-well microplate. To order please see companion products listed below. CAUTION: Rare earth magnets can be extremely powerful. Care should be taken when handling these magnets. Keep magnetized parts away from mechanical/electrical instruments. The strong magnetic fields of neodymium magnets can also damage magnetic media such as floppy disks, credit cards, magnetic I.D. cards, cassette tapes, video tapes or other such devices. They can also damage televisions, VCRs, computer monitors and other CRT displays. Never place neodymium magnets near electronic appliances. Never allow neodymium magnets near a person with a pacemaker or similar medical aid. The strong magnetic fields of the magnet can affect the operation of such devices.Neodymium magnets will lose their magnetic properties if heated above 80°C (175°F). Neodymium magnets should never be burned, as burning them will create toxic fumes. What are the magnets in the 96-Well Magnetic Separation Rack made out of? What are the dimensions of each magnet in the 96-Well Magnetic Separation Rack? How is each magnet magnetized in the 96-Well Magnetic Separation Rack? What plates are compatible with the 96-Well Magnetic Separation Rack?